Brewed with "an international menagerie of expensive hops", City Steam Innocence promises to be an intensely hop-forward IPA. Pours an incredibly dark, hazy orange with tons of sediment resting at the bottom of the glass. This is one dirty IPA. As promised, the hops smack you in the face on the aroma. Also getting a lot of pine as well as a noticeably sticky resin. There is a faint, faint juiciness, but this is definitely all hops, all the way. Bitter, bitter hops first and foremost. Followed by sticky pine. There is quite a bit of a sweet malt presence throughout which makes the beer feel heavier than 7.20%. The aftertaste is again all of those hop varieties which linger for a few seconds followed with hop resins and oils. The mouthfeel is medium and nowhere near too thick or syrupy. Believe it or not, the drinkability is pretty decent. I found myself easily drinking the whole glass in just a few minutes. Then again, I'm a hop head, so those wary of hoppy beers may find themselves taking it slow. 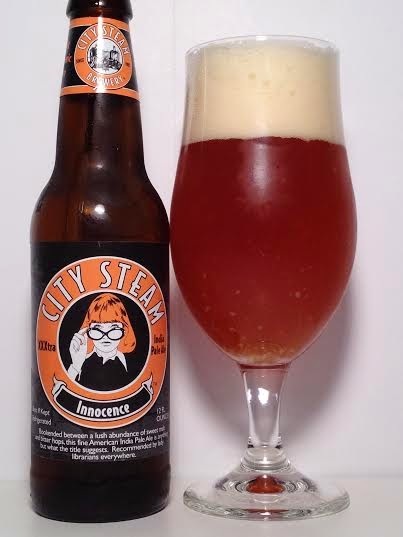 City Steam Innocence comes at you with pure hoppiness and sweet malts. I wouldn't call it "too hoppy", but it really does assault your palate with its bitterness, which is more reminiscent of an Imperial IPA instead of a 7.20% American IPA. While I found it to be easy-drinking, the presence of too much pine and resin can overpower the hops. Still, a solid IPA.